JaCG reader, Michael K., sent me the link to this car. 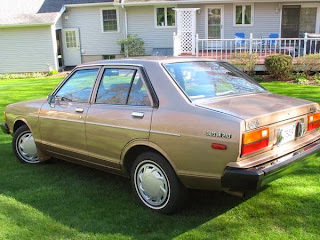 He titled his email "The Best Looking Datsun 210 You Will See Today." It should have been titled, "The Best Looking Datsun 210 You May Ever See." When you think about it though, did you ever really see these cars? The 210 sedan was an invisible car in its day. Nissan / Datsun sold a ton of them, but you never really noticed them. They went about their business efficiently and reliably, until they were wrecked or became too rusty to be safe. There's a good chance that you haven't noticed that most of these cars are gone now. It's just that type of car. Anonymous. Datsun's ads claimed that the 210 would get 35 MPG around town and 47 on the highway. I think you would need near perfect conditions to achieve those numbers, but the 210 was frugal, thanks in part to an engine that produced less than 70 horsepower. It took around 17 seconds for a 210 to hit 60 MPH. It must have taken Nissan's styling department about an hour to design this car's body. It has a hood, 4 doors, and a trunk. There is absolutely nothing - good or bad - that makes this car stand out. 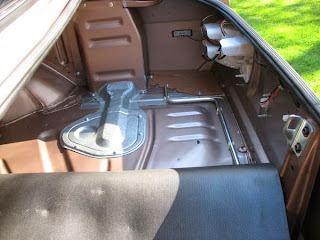 The interior is typical of late seventies / early eighties Japanese econoboxes. Some gages and some lights. 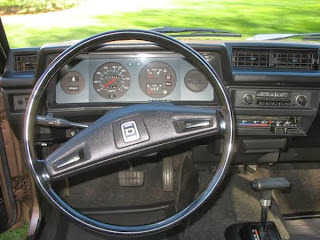 The dashboard is angular and well laid out. The seats are thin, but decently shaped. This car is owned by the seller's 82 year old mother. It has just 29,800 miles on it. It looks like it did when it left the dealer in 1982, right down to the stock radio. It is a true time capsule. These days it seems like any old Japanese car, no matter how boring or mundane it was when new, is a candidate for customization. They wind up slammed and sitting on big chrome rims. Lets hope that doesn't happen to this car. Lets hope the new owner has the good sense to keep it invisible. Located in Thomaston, CT, click here to see the Craigslist ad. A big thanks to Michael K. for sending me the link to this car. Why do these cars ALWAYS end up with crappy Wal-Mart hubcaps?!? 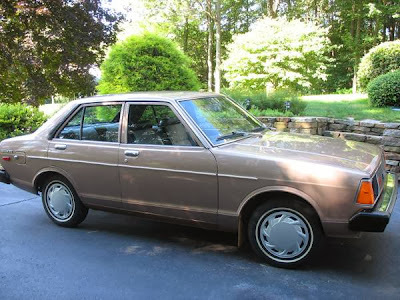 These 210s - along with their 323, Civic and Corolla peers - were always intended to be used - serving as daily driven, basic, functional transportation devices. This example is only interesting because it *wasn't* used that way, and therefore, is unusually well preserved. They certainly weren't intended to be interesting (in fact, they are painfully boring to drive). Someone with some extra garage space should buy this and loan it out to movie prop companies. They often need vintage cars that still look new to use as background vehicles. 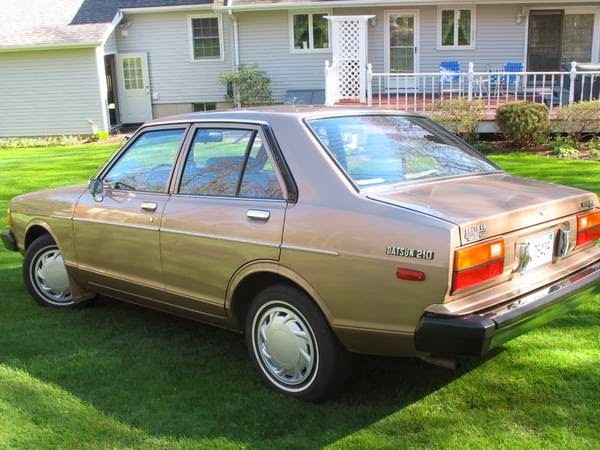 It's refreshing to see a ultra low mileage car from the 1980's without an astronomical price tag. I took my driving test in a wagon version of this when I was a kid. It was my neighbor's car and he was understanding enough to know my Dad's 66 Plymouth Fury wagon hooptie wasn't gonna cut it at the DMV. We had these for drivers ed. also. 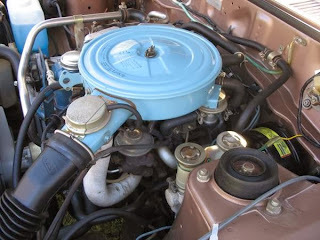 These were definitely appliance type cars but you couldn't kill 'em; Japan's Plymouth Valiant.